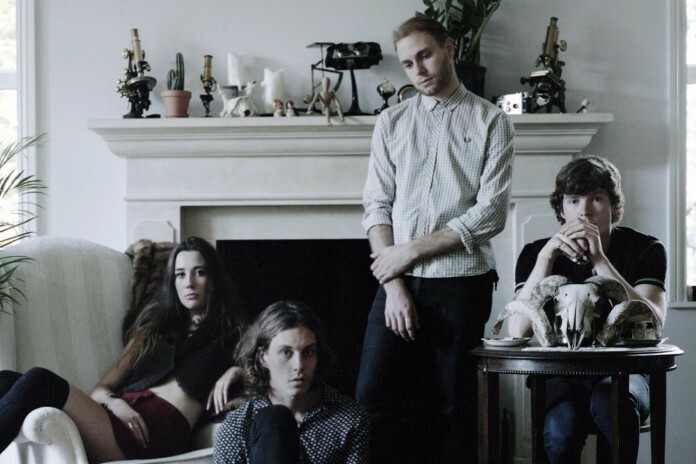 Chances are you definitely haven’t heard of Yonaka. I had been sent on my first journalistic adventure to interview a band in Manchester, and as you can imagine I was bricking it. I was solely focused on the band in question and I entered the venue trying my very best to look serious and, you know, music-y. Yonaka came on stage as the support act… and they absolutely killed it. I was caught totally off-guard at the quality of their music and the passion with which it was being played, despite the audience numbers dwindling at a mere 40 bodies. Yonaka have defined themselves as “dark-pop”, which I suppose is accurate; their sound is quite indie but with a definite twist of pop. I’ve always found listing convoluted combinations of existing artists as the best way to describe bands to people, so strap in because I’m going to deftly attempt to do just that: I would say Yonaka are a mix of old school PJ Harvey, perhaps with a sprinkling of Siouxsie and the Banshees, along with a fair dollop of Nico Vega. However, unfortunately for me there’s an element to their sound that I can’t quite nail down or find an appropriate comparison for, because it is simply their own. They have a strong sonic distinctiveness, exacerbated through their use of pounding drums and huge, reverberating riffs running parallel to the strikingly dynamic vocals of lead singer Theresa Jarvis. It is a real travesty that I only have 2 tracks to point you towards: ‘Run’ and ‘Ignorance’. You can, however, see a live rendition of another one of their songs, ‘Blue’, on BBC iPlayer after they hit the BBC Introducing stage at this year’s Big Weekend. This glimpse into their skills as a live band is what might hook you into their sound. You can feel the energy and you can see the crowd really getting into it. So now all I can do is urge you, dear reader, to make the right choice. That right choice being to listen to Yonaka’s three available tunes and to discover your next favourite band. In the lyrical words of Theresa Jarvis: Ignorance is not bliss… so in that case get off your arse, turn everything up to 11 and check ‘em out.